Sundry notes and tech tips on Radiance – old and new. 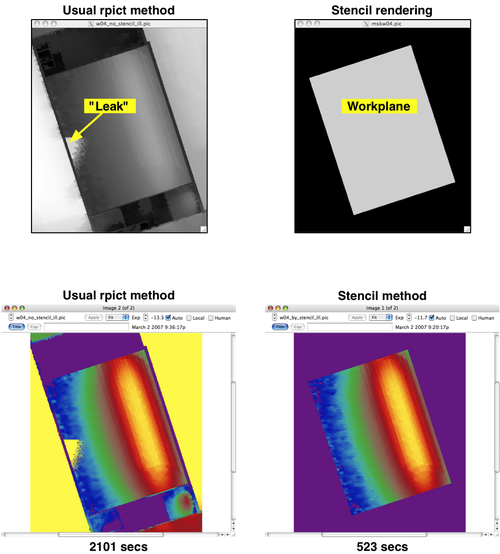 Scenario: Creation of images showing the distribution of illuminance across a workplane from a high viewpoint and using the fore clipping plane to remove foreground objects. This method works fine most of the time provided that you can crank-up the ambient parameters to avoid light leaks. These can be fairly nasty when they do occur – the pixels affected by a leak can have an illuminance much higher than nearby unaffected pixels. In the example shown, the leaky pixels have a value >1000x that of their non-leaky neighbours. Needless to say, these affected pixels play havoc with any numerical measure of illuminance that you might want to get from your image. The computational cost of leak prevention can be expensive. These need to be included in the rtrace command for the stencil method. The effectiveness in terms of leak prevention and increased speed will be highly dependent on the scene, the view and the ambient settings. As ever, some testing is advised. See Thomas Bleicher's variant on the stencil method here. Not that you are likely to be transcribing this code on an iPhone/Touch, but you should know that the code blocks might not render correctly on these mobile devices.